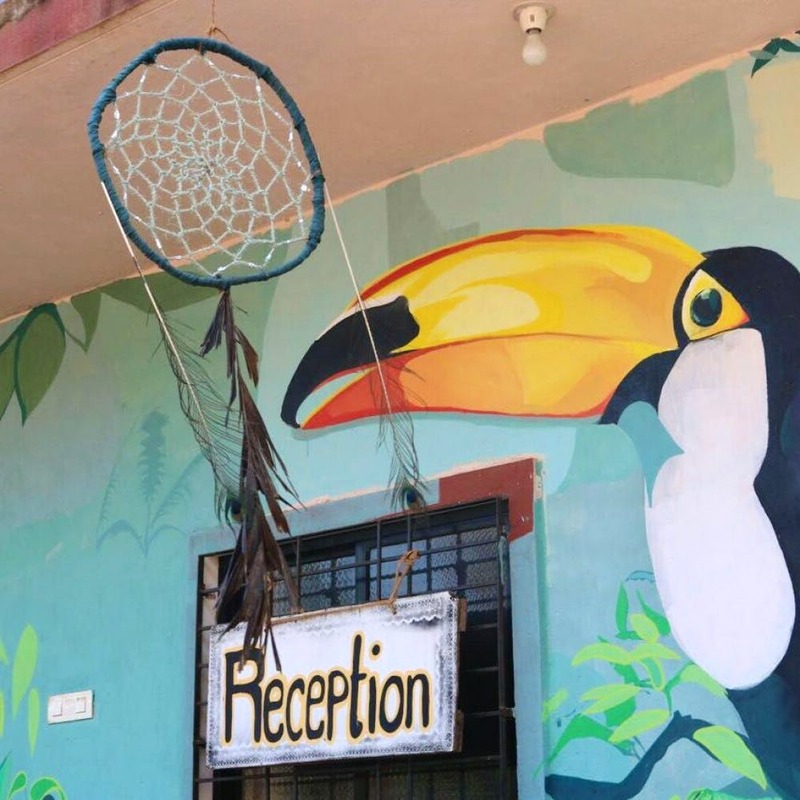 Located in the beautiful little village of Keri, far up north, The Dream Catchers — Hostel & Cafe is a charming hostel surrounded by lush nature and mountains. Just about 500m away is the scenic and secluded Querim beach, one of the few remaining unspoilt beaches in Goa. Everything, really. Starting with a garden, a fireplace, a bamboo hut where you can live amidst nature and an open space for travellers to park their hammocks and tents. Dream Catchers is a community operated hostel, where the community works together on upcycling projects to recreate from waste. True to their philosophy to re-create, as you enter, the first thing you will notice is an archway made using upcycled beer bottles and painted seeds. The hostel and cafe also works like a live-in gallery space, where everything from the walls to the garden to courtyards are both a canvas up for the grabs, or your own little exhibit. The owner Suhail and his crew, have created this unique vibe where art and sustainability take centrestage. The space was originally conceptualised as a backpackers cafe and artist residency, and eventually developed this identity as a skill exchange centre. During your stay here you are likely to run into musicians, painters, singers, artists from different parts of the world, huddled over a new artwork they’re creating together, or enjoying their beer over a game of cards. The cafe also has its own organic kitchen garden where they grow spinach,mustard, papaya, basil, and a number of other fresh veggies for the in-house cafe. The owners go a long way to ensure facilities from travellers including a money exchange centre, vegan food, organising day trips to the neighbouring villages. So this time around when planning a trip to Goa, give the usual madness a miss and head to this idyllic bubble of creative energy! Fort Tiracol and the Chapora river are very close. They're both very scenic and perfect spots for lazing, exploring and sitting with a sketch book.